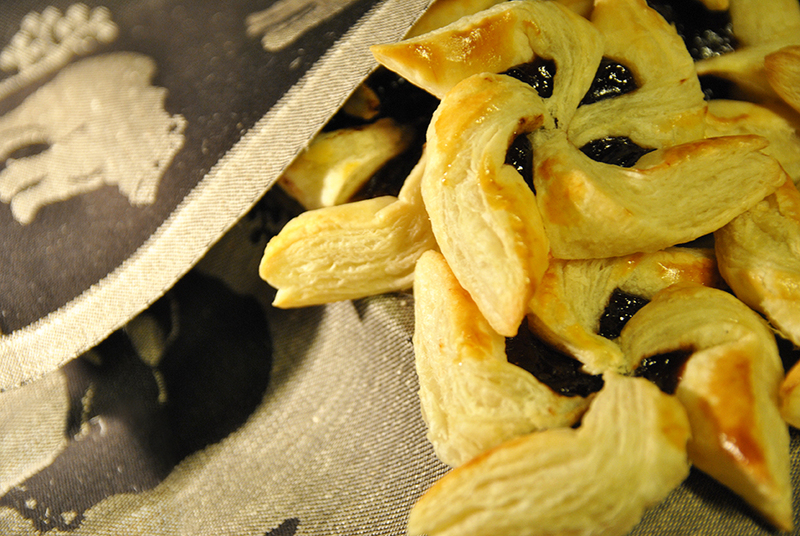 These Finnish Christmas pastries are everywhere during the Christmas season! Some call them joulutorttu, meaning Christmas pastry, others tähtitorttu, meaning star pastry, but whatever the name, they taste like the traditional Finnish Christmas. 🙂 They’re very easy to prepare, whether you decided to make the dough yourself or use the store-bought one. I gotta admit that I’m always using the pre-cut butter dough sheets and never make my own, because the Christmas time is always so busy with a lot of cooking and baking and I have to save time. The butter dough recipe is the one I use for making salty pastries but it works just as well for these Christmas star pastries. Cut the dough in squares that are 12-15cm long on each side or cut a ready-made sheet in half. Slice the corners as you see in the picture leaving a 2,5×2,5cm space uncut for the jam. Put a teaspoonful of plum jam in the middle and press every second corner together to form a star. Brush the stars with egg white before frying. Bake in 175c until golden brown. If you like, you can decorate the stars with powdered sugar.